The ARVA Axis was discontinued in 10/2013. Summary: The now-discontinued ARVA Axis was the fewer-featured little brother to the ARVA Pro W (aka Link). This followed the trend of the Pieps Tour (the fewer-featured little brother to the Pieps DSP) and the Mammut Element (the little brother to the Mammut Pulse). I own, but have not fully tested, the Axis. 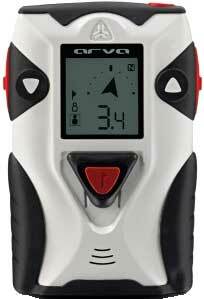 When searching, the Axis can point in 5 different directions while the Pro W has a freely-floating arrow that is based on a compass (similar to the Mammut Pulse). The Pro W, but not the Axis, uses data that is transmitted on the "w-link" frequency by the Pro W or Mammut Pulse to improve marking when searching for multiple transmitters. The Axis has a neoprene case with thin harness straps while the Pro W is stored in a large, semi-rigid holster with a wide shoulder strap. The Axis is white with black "bumpers" on the housing whereas the Pro W is white with gray bumpers (the Pro W's predecessor, the Link, was all black). The Axis was priced $90.00us less than the Pro W.
The Axis can be toggled between analog and digital modes whereas the Element gave up this feature from its big brother. The Axis retains two buttons whereas the Element and Tour eliminated one of their buttons. The Axis (and Tour) retained its lighted display whereas the Element gave up this feature. The Axis senses motion before reverting from searching to sending whereas the Element gave up this feature. The Axis also lets you specify how many minutes must elapse before it auto reverts whereas this feature is found in the Pulse but not the Element. The Axis retained its earphone jack whereas the Element didn't. The Axis retained the ability to customize its startup screen whereas the Element didn't. Many of the features that were retained in the Axis, such as the customizable startup screen, the lighted display, and the earphone jack, add benefit without adding any complexity. Even the ability to toggle to analog (by pressing and holding both buttons) adds significant power yet can be completely ignored. The one feature that was retained in the Axis and which does add a complexity is the two side-buttons. Whereas the Mammut Element and the Pieps Tour have one off/send/search switch and one "mark" button, the Axis has an on/off button, a search switch (with an "Enter" button in the center of the switch), and two side-buttons. It's easy enough to learn how to use the Axis, but it isn't as easy as the Element and Tour. Pros: Analog and digital modes. Cons: Similar "cons"e; to the Pro W.